JA Solar Holdings Co, one of the world-leading manufacturer of high-performance photovoltaic (PV) products, has announced that it will supply all bifacial mono PERC double glass modules for SolarGrid’s 3MW solar power plant in Brazil. This will be the Chinese solar products maker’s entry into Brazil’s market with this type of equipment and the country’s first bifacial double glass power plant. Located in Minas Gerais, the project is developed and constructed by SolarGrid Energia, a recognised new energy developer in Brazil. While Brazil is well positioned to build photovoltaic power plants, the semi-arid climate and high-temperature environment in the summer result in stringent requirements for PV module performance, JA Solar said in a statement. The solar plant is expected to generate 7.1 million KWh of electricity per year and reduce carbon dioxide emissions by 5,284 tonnes annually. Operating under the same environmental conditions, the JA bifacial mono PERC double-glass modules can generate electricity 9.5 per cent higher compared to mono PERC single-sided modules. JA Solar is the holder of the core intellectual property rights and patents associated with its PERC technology. With that, JA Solar›s solar products have excellent quality and superior performance in power generation. 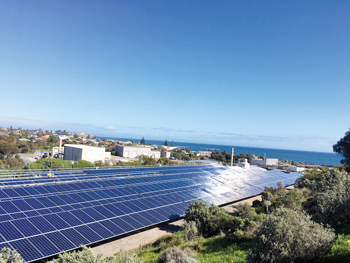 The modules used in this solar project incorporate high-efficiency bifacial PERC solar cells with a solid double glass structure to ensure stable power output and electricity generation in the region of such extreme climate. Additionally, the JA Solar bifacial PERC double glass modules used in this solar project are equipped with parallel single-axis trackers, which can highlight the advantages of electricity generation of the bifacial modules and substantially increase power output of the system.